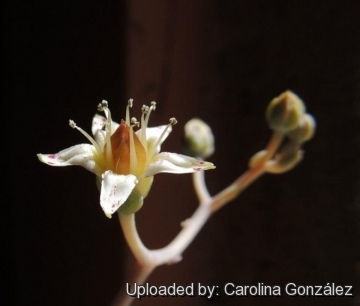 Origin and Habitat: Graptopetalum paraguayense, originally thought to be native to Paraguay, as the species name implies, was discovered on cactus plants imported to New York in 1904 and only later determined to be from Еast-Сentral Mexico (probably Tamaulipas), though no plants of the species have been rediscovered in the wild since. This species is naturalized in Australia (Queensland). Echeveria paraguayensis (N.E.Br.) hort. ex Poelln. 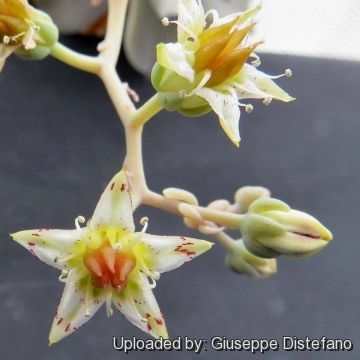 Description: Graptopetalum paraguayense (Graptopetalum weinbergii) is a clump-forming, perennial succulent with a basal rosette of thick fleshy leaves resembling Echeveria. The common names include Mother-of-pearl-plant and Ghost plant probably with reference to the look of the greyish white, opalescent leaves. This is not to be confused with Monotropa uniflora which is also referred to as the “Ghost Plant”. Plants turn pinkish yellow in hot, dry conditions and blue-gray when pampered with partial shade and regular water. They bears star-shaped, white-and-red flowers in spring. Graptopetalums may form crested growth. 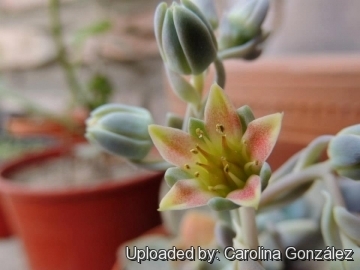 Habit: Graptopetalum paraguayense is a hairless, perennial rosette-forming, succulent plant, loking like an Echeveria but the rosettes grow at the tips of ever-lengthening stems creating a low spreading colony to only about 30 cm tall. Rosettes: 9-15 cm across, with c. 15-25, loosely shingled, leaves, and forming a symmetric Fibonacci spiral. Old leaves at the base of the rosette wither and fall off. New growth is from the centre of the rosette, so over time you get a denuded, awkwardly long stem with a rosette on the end. Leaves: 2-8 cm long 1.5-2.5 cm broad, thick triangular to spathulate, pointed, flat or hollowed above, keeled beneath. The leaves range in colour (even on the same plant) from grey-green, pale blue, light pinky-lilac, to light purple and are covered by a greyish bloom giving the whole plants an opalescent shine (Exhibiting a milky iridescence like that of an opal or pearl). The thick leaves hold excess moisture so the plant can withstand periods without rain. Flowers: Star shaped, white with small red specks, c.2 cm in diameter, borne on stems to 15 cm long with 2-6 branches, each with 3-14 flowers. Petals c. 1 cm long white, dotted with red. 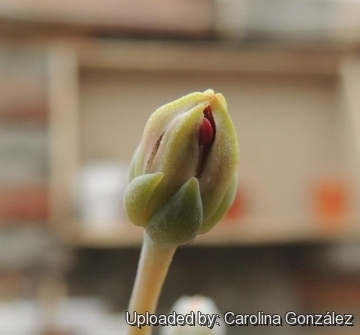 Blooming season: The plant flowers occasionally in late winter-early spring. Graptopetalum paraguayense (N.E.Br.) E.Walther: has rosettes 9-15 cm across. Leaves 15-25 leave,s 2-8 cm long, grey-blue-green to light purple. Flowers c. 2 cm in diameter with white petals, dotted with red. Distribution: Mexico (Tamaulipas). Graptopetalum paraguayense subs. bernalense Kimnach & R.Moran: has yellowish leaves not more than 4 cm long. Distribution: Tamaulipas, North-East Mexico. 8) "Botanica. The Illustrated AZ of over 10000 garden plants and how to cultivate them", pp. 410-411. Könemann, 2004. 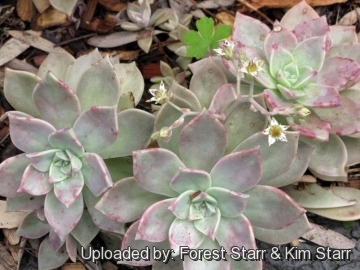 9) Forest & Kim Starr “Graptopetalum paraguayense (Mother of pearl, ghost plant)”. Plants of Hawaii. <http://www.starrenvironmental.com>. Web. 27 Sep. 2014. 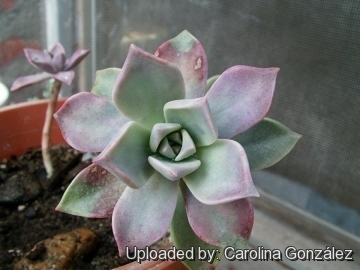 2) San Marcos Growers contributors “Graptopetalum paraguayense - Ghost Plant” San Marcos Growers <http://www.smgrowers.com>. Web. 27 Sep. 2014. 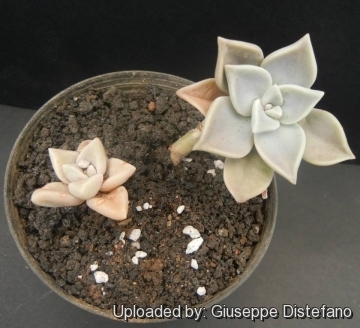 Cultivation and Propagation: Culture of Graptopetalum paraguayense is fairly easy, it can tolerate full sun (where it stay compact) but a much better exposure is light shade. It is always a favorite carefree windowsill citizen, an excellent addition to any garden. 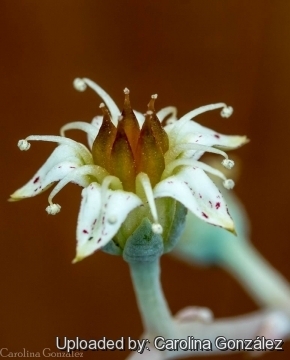 The plant's origin will make its rosettes tolerate heat and drought. They are true survivors. Exposition: Likes light shade to part sun (it will take a few hours of sun without a problem), but adapts very well to full sun and shade too. It can overwinters well also under grow lights in a cool room of the house. Graptopetalums are chameleons. Those grown in partial shade tend to be blue-gray; in full, hot sun, gray-pink; in full sun, pinkish gray to yellow. Soil: Although it needs a soil that is gritty and porous with good drainage, the soil must be able to hold the moisture that the plant requires. The ideal soil should contain equal parts of loam with small gravel added (eg pumice or lava grit). Good drainage is essential. Watering: During the summer growing period the plant appears to need much more water than the average succulent. Water when plant is dry and do not water again until the soil is completely dry again. Dislikes over-watering. Pay particular attention to make sure that they do not rot at the root from soggy soil. During October to March, water very sparingly, using only enough water to keep the foliage from shriveling. In a very humid situation in winter, it can rot even if totally dry. It likes dry air as much as dry soil. Fertilization: Fertilizer should be applied only once in early spring , diluted to ¼ the recommended rate on the label. 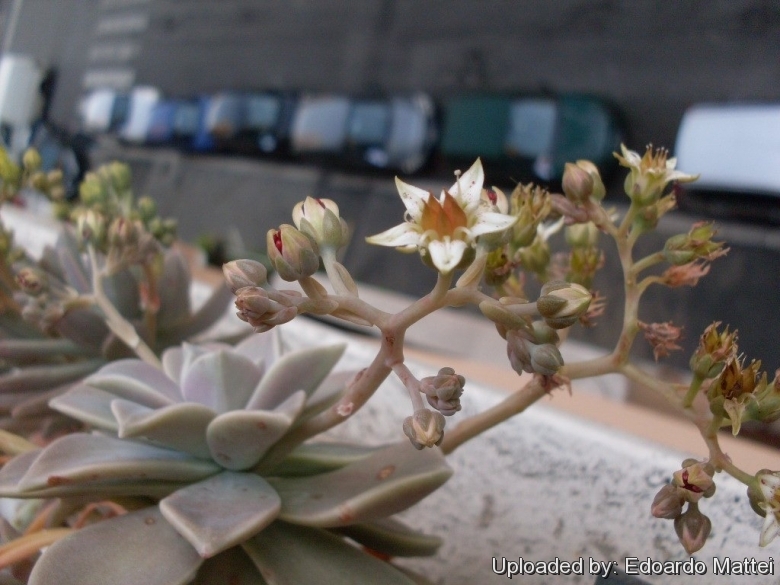 Hardiness: It is usually recommended to avoid freezing temperatures, but it is a very hardy succulent and can rebound from being frozen and is useful in areas that drop below 7° C. It requires low temperature for flower formation and it will not flower unless it is overwintered for at least a month at 15° C or less. Pests and diseases: The tightly-packed rosettes are attractive to mealy bugs. Uses: A great plant for use as a groundcover, in gravel gardens, paved areas, rockeries, in hanging baskets or pots, or for spilling over walls. It is a bit brittle so avoid handling when possible and not for planting in areas with much traffic. Because the stems are so fragile, it is best to pick the best location for ghost plant and then don’t move it. Try mixing with other succulents and alpines. Propagation: It is is propagated by the division of offshoots or by individual leaves, rooted in sand or in dry vermiculite. Any rosette that breaks off has the potential to root and start a new plant. Even a leaf that drops off will root below the parent plant and produce a new rosette quickly. Because leaves and cuttings root effortlessly, graptopetalums are among the easiest succulents to propagate.